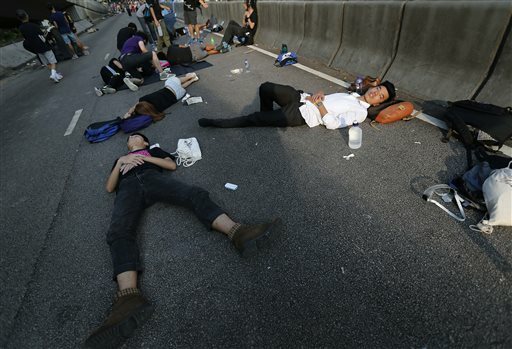 HONG KONG (AP) — Hong Kong’s leader said China won’t back down from its decision to limit voting reforms in the Asian financial hub as pro-democracy protesters set a Wednesday deadline for a response from the government to meet their demands. The unequivocal statement from Chief Executive Leung Chun-ying on Tuesday dashed hopes that the standoff between demonstrators and authorities could be resolved quickly through negotiations. It does not come as a surprise given that showing a willingness to talk would have made the Chinese leadership appear weak, which could embolden dissidents, critics and separatists on the mainland. As the student-led protests that have snarled traffic and disrupted public transport entered a fifth day, Leung urged demonstrators to show consideration toward other residents and stop the unprecedented show of civil disobedience. Leung, a Beijing appointee who is deeply mistrusted by Hong Kongers, also said that mainland communist leaders would not reverse their stance requiring a pro-Beijing panel screen candidates in the territory’s first direct elections, scheduled for 2017, adding he wouldn’t resign before then. “The central government will not rescind its decision,” Leung said. A brief statement from the Occupy Central civil disobedience movement said it had set an Oct. 1 deadline for Leung to meet their demands and step down. 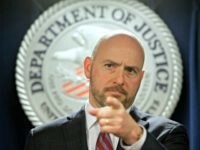 The group said on Twitter it would “announce new civil disobedience plans same day,” without elaborating. Student leaders, who have played a big role in rallying the young people who’ve made up the majority of the protesters, planned to make their own announcement Tuesday about further plans and demands. Even larger crowds are expected to flood the streets Wednesday, China’s National Day holiday. The government said it was canceling a fireworks display to mark the day. One day after police shocked the city by firing tear gas at the crowds, the protesters passed a peaceful night Monday singing as they blocked streets in several parts of Hong Kong. They also staged a brief “mobile light” vigil, waving their glowing cell phones as the protests stretched into their fourth day. Crowds chanted calls for Leung to resign, and sang anthems calling for freedom. Police arrested a man who drove his Mercedes-Benz through a crowd of protesters occupying a street in the densely populated Kowloon neighborhood of Mong Kok. Local television footage showed people scrambling as the car sped through the crowd while honking just before 2 a.m. Tuesday. No one was injured. Thousands of people, many of them high school or college students doing their homework, gathered on a six-lane highway next to the local government headquarters ahead of the student leaders’ announcement. Still, the movement seemed to be taking on a life of its own. “Police cordon lines were heavily charged by some violent protesters. So police had to use the minimum force in order to separate the distance at that moment between the protesters and also the police,” said Cheung Tak-keung, the assistant police commissioner for operations. The protests have been dubbed the “Umbrella Revolution” by some, because the crowds have used umbrellas to not only block the sun, but also to stop the police from hitting them with pepper spray. Political slogans calling for freedom have also been written on the umbrellas. Many younger Hong Kong residents raised in an era of plenty and with no experience of past political turmoil in mainland China have higher expectations. Under an agreement set in 1984, before most of them were born, Beijing promised to allow Hong Kong residents civil liberties — unseen in the rest of China — after it took control of the city in 1997. China’s communist leaders take a hard line against any threat to their monopoly on power, including clamping down on dissidents and Muslim Uighur separatists in the country’s far west, but it cannot crack down too harshly on the semi-autonomous territory where a freewheeling media ensures global visibility. Across the border, Chinese state media have provided scant coverage of the protests beyond noting that an illegal gathering spun out of control and was being curtailed by police. Associated Press writers Kelvin Chan, Louise Watt and Joanna Chiu contributed to this report.